On my backpack walk after supper, Franco and I noticed something odd as we climbed the hill. As is our habit, we began the hike by walking to the west. We noticed the neighbor’s fire number sign glowing as though it were on fire. There was no sun visible in the sky, although we were close to sunset. I got to thinking as I climbed the hill that the date was in fact 9/21/10, or the autumnal equinox. As that fact was sinking in, we crested the hill and could see the rest of the road about 1/2 mile distant which was framed by trees on both sides. As we walked, the sun broke through some clouds, and plunged out of sight exactly in the middle of the tree framed road. What a great demonstration of the equinox! 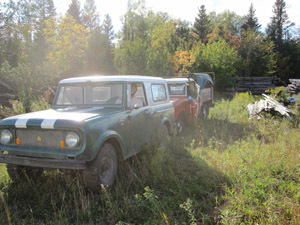 Earlier in the day, I was working on the sawmill making lumber for the upcoming Estivant Pines’ project when my friend Jason drove up in his Scout 80. This is the vehicle he wanted my Scout for for parts. I halted my work on the sawmill and worked with him to get the Scout roadworthy. He added brake fluid and got at least one of the brakes sort of working. We made sure the steering was ok and he backed his Scout up and we hooked things up. He only lives about 2 miles away, and we took it very easy. It worked like a charm. Now the Scout 800 has a home where it will get used, instead of being an eyesore in my field. Win win. After Alice got home we walked out to the back pond and had a nice sit on the dock. 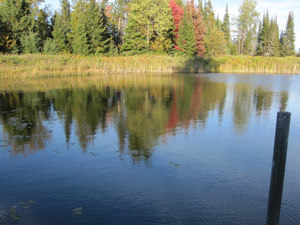 I took this picture to show the beautiful fall colors just starting to peek out, and putting a reflective light show on the surface of the pond. Franco contributed by bringing his stick to be thrown across the water to the trail beyond. He is a beautiful creature when he is running full bore for his stick. He’s developing a habit of dropping his stick in the water rather than bringing it to me to throw for him. In the past I’ve gotten out of my chair and gotten the stick and thrown it. It seemed to me tonight that he figured that was the best way to get his stick thrown. Maybe I was a bit cranky, but I just sat in my chair and let him get his own darn stick. He eventually dove in and retrieved it. Good dog. This entry was posted on Tuesday, September 21st, 2010 at 9:32 pm and is filed under Uncategorized. You can follow any responses to this entry through the RSS 2.0 feed. You can leave a response, or trackback from your own site.